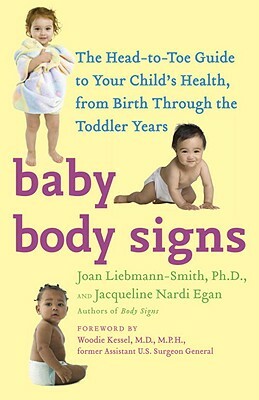 From blue birthmarks to bulging belly buttons, dimpled ears to double eyelashes, this indispensable guide will teach you how to interpret the “body signs” that are important clues to your baby’s health. Baby Body Signs will help you decide when to call the pediatrician and when to relax and stop worrying. What’s more, it’s packed with fascinating facts about child health—from how in medieval Europe babies were expected to talk when they had all their teeth to the fact that the ears are the first part of the body to reach full size. As entertaining as it is informative, this is the book you’ll want to keep close at hand throughout your baby’s infancy and toddler years. Joan Liebmann-Smith, PhD is a medical sociologist and award-winning medical writer. Her articles have appeared in American Health, Ms., Newsweek, Redbook, Self, and Vogue, and she has appeared on numerous television talk shows, including The Oprah Winfrey Show and The Today Show. She has a daughter, Rebecca, a cat, Fazelnut, and lives with her husband, Richard—also a writer—in New York City. Jacqueline Nardi Egan is a medical journalist who specializes in developing and writing educational programs with and for physicians, allied health professionals, patients, and consumers. She is also a former medical editor of Family Health magazine. She has a daughter, Elizabeth, two dogs, Coco and Abby, and divides her time between Darien, Connecticut, and Sag Harbor, New York.